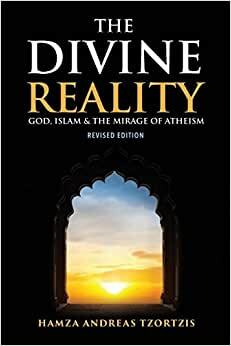 In The Divine Reality, (Revised 6/2018) Hamza Andreas Tzortzis provides a compelling case for the rational and spiritual foundations of Islam, whilst intelligently and compassionately deconstructing atheism. Join him on an existential, spiritual and rational journey that articulates powerful arguments for the existence of God, the Qur’an, the Prophethood of Muhammad and why we must know, love and worship God. He addresses academic and popular objections while showing how contemporary atheism is based on false assumptions about reality, which leads to incoherent answers to life’s important questions. Hamza Andreas Tzortzis’s new book presents a much needed comprehensive account of Islamic theism that draws upon Western and Islamic thought. Hamza Tzortzis is an international speaker, writer and instructor. He has a PgCert and an MA in philosophy and is currently continuing his postgraduate studies in the field. Hamza has studied Islamic thought and theology under qualified scholars. He has delivered workshops and courses on topics related to Islamic thought and philosophy. Hamza has debated prominent academics and thinkders on Islam and atheism. Start reading The Divine Reality: God, Islam & the Mirage of Atheism on your Kindle in under a minute. "The Divine Reality takes you through the world of Islamic theism in a systematic and coherent fashion. It is a pioneering effort which will hopefully guide the reader, and other writers, on how to answer the questions related to God's existence and worship from the perspective of Islamic thought." Shaykh Omar Suleiman, President of the Yaqeen Institute for Islamic Research and Professor of Islamic Studies at Southern Methodist University. Hamza Andreas Tzortzis is an international speaker, writer and instructor. He has a postgraduate degree in Philosophy and is currently continuing his postgraduate studies in the field. Hamza has studied Islamic thought and theology under qualified scholars. He has delivered workshops and courses on topics related to Islamic thought and philosophy. Hamza has debated prominent academics and thinkers on Islam and atheism, his interlocutors have included Professor Lawrence Krauss, Professor Peter Simons and Professor Simon Blackburn. He has over a decade of experience in articulating a compassionate and rational case for Islam. Hamza loves reading, travelling and training in the gym. He is a trained Boxer and Wing Chung Kung Fu practitioner. You can follow him on his website at hamzatzortzis.com, Twitter @hatzortzis, Instagram @hatzortzis and Facebook @hamzaandreastzortzis. Let it be known right from the beginning, in no uncertain terms, Hamza Andreas Tzortzis has really outdone himself with this spectacular "dawah" book - (although I see it as something quite a bit more than just a mere dawah book). A little background info on why I purchased this book: Over the years, I've followed the debates of Hamza Tzortzis with fellow atheist academics and have admired brother Hamza's admirable approach to the defense of this beautiful religion and way of life. His character in debates speaks volumes for his compassion for fellow human beings and his sincerity and humbleness in wishing for people to be guided to the truth. He is not one to raise his voice to outspeak or interrupt another, nor is he rude in his demeanor, even when others lack a positive attitude. I've always received the impression that when he speaks, it could come from no other place than his heart. Of course, he isn't perfect as he's slipped up in manner here and there, but we are only human. I say all of this not to elevate him to a position of praise, but to introduce the author and give my impressions that I had of him, even before he decided to author his first book (which is this one). It is my own personal opinion that an author's truthfulness and integrity should be weighed, along with their intelligence, before someone commits to buying a person's work and supporting them. And it's upon seeing and analyzing brother Hamza over the years that has brought me to purchase his first publication. Anyway, after following his debates, having read a good amount of his articles from his website and learning much, I was surprised and excited when I found out from his Twitter page that he's authoring this book. So I bought a copy. Having taken about 4-5 days to read through it, I was left very impressed and ready to read through it for a 2nd time. Hamza's coherency and reason in his arguments for God's existence/Islam and why atheism lacks a foundation to stand upon has always been solid in his debates, and having collected, organized, transposed, and polished those arguments into this book (while adding a number of others I've never heard him use), he's taken those already solid arguments and raised their efficacy level to quite a sublime degree. I can't think of the amount of times I would come across an argument in a particular chapter, saying to myself, "Man... that makes a whole lotta sense." That's a testament to the quality of the arguments as a whole. Each argument is able to stand on its own feet, without really having to rely upon another, and yet at the same time, the flow from one chapter to the next, from one argument to the next just.... works! It is far from being organized in a haphazardly manner; on the contrary, the chapters and arguments contained within them seem to be organized in such a way that it would make perfect sense if that was considered the defacto structure to be used when debating an atheist on such a subject of theism vs atheism! --- You can even see the logical flow of the chapters from merely the titles, that's how well put-together and assembled the book is. Also, I appreciate how the author uses examples and illustrations to make it easier for the layman reader to understand the arguments he presents, or to recognize why a counter-argument doesn't make sense. Of course, no book is perfect aside from Al-Qur'an. This book contains its share of typos, some more significant than others, however it detracts very minimally from its quality. However, where it really counts in terms of providing a rational basis for why it makes perfect sense to believe in an All-Powerful, All-Knowing, Eterrnal, Most-Merciful, Most-Loving, Unique Creator, why Islam must be from such a Creator, and why atheism should be rejected, could not have been executed with better precision (in my opinion). Those are my thoughts. Thanks for reading my review! *Update 09/09/18: I have read the Revised Edition of the Divine Reality some time ago (about a month or 2 ago) on Kindle when it was first released, and told the author I would update my review to reflect the new changes and give my thoughts regarding this new edition, but I have been too lazy to actually update it until now, lol. So, just how much of a change was made in the Revised Edition? Was the changes significant enough to warrant a purchase of the new edition if you already own the original? What do these changes or additions constitute of? Well, the changes (not to get confused with the additions) are very, very minor. Of what I noticed, he removed a particular hadith which had a weak chain of narration that he used in the original book, which I brought to his attention when he first used it. I respect that he was sincere and humble enough to remove the weak Hadith, as a work of his quality should reflect more reliable sources (that was the only weak Hadith he used in the original version anyway). As for the additions, he has made some substantial additions in the form of a couple of additional contentions that atheists put forth to certain arguments of his, and refuted them likewise. He has also structured the arguments a bit better, where I feel they flow/transition from one thought or idea to the next is smoother because of the additional clarifications and explanations he included which are sprinkled throughout the book. These additional clarifications and explanations makes for an all-around bit easier read where added. And of course he has made corrections in terms of typos and whatnot. But it should be noted that no entire chapters were added. The same 16 chapters that were in the original that I listed in my original review above, is the same exact chapters that in the Revised Edition. In fact, the arguments themselves are all practically structured the same from what I can tell, despite the changes and additions I have already noted being added. So what to make of all this? Do I believe it warrants a repurchase of his book for the changes and additions that he made for those who already own a copy of the original edition? As much as I love The Divine Reality, and Ustadh Hamza Tzortzis, if I am being perfectly honest, I don't believe it justifies another purchase beyond the original. Is it nice to have? Yes. Should you buy a copy if you wish to support his work? Of course. Do I believe that enough content was provided that justifies a purchase of the revised edition, to the point where you feel you are missing out on substantial content? No, not really. However, does it make a book which I originally gave 5 stars even more worthy of those 5 stars and make it even more of a must buy for those who don't already own a copy, or for a gift to a friend or stranger who doesn't know why we believe in God, Prophet Muhammad (peace be upon him) and Islam? Still one of my favorite intellectually-stimulating books to read through, and I imagine it will be for a long time to come. Be sure to look out for Hamza's new book that is around the corner called "The Failed Hypothesis." Best way to describe this book is the clearance of doubt for many Muslims facing rational debates that make you question certain aspects of the islamic faith and deen. A worthy intellectual adventure for one to reflect and strengthen their Islam. Very organized in explaining aspects of creation and creator, questions raised by intellectuals on atheism and theism, and the Islamic ans quranic take on addressing those question. Must read. The only book on this topic that I know of, at the moment, on atheism written by a Muslim. Islam has such a rich tradition, it really has all the answers to any sort of doubt in God that no other religion can compare to. Rock-solid read and I hope more books on this topic will be written by Muslims in the future. ...especially in this day and age where shunning God out of your lives is revered and celebrated. This book gives detailed and relatable explanation of every possible question or doubt regarding a Supreme/Higher Power. In addition, this book is not only a excellent source of such discussions but also can answer many questions of even believers who are not comfortable asking difficult questions and can erase any doubts in their own minds. I'll admit, couple of chapters in this book do tend to get a bit philosophical and may not be for every reader but they all serve a purpose. Highly recommended for both believers and who don't believe in any thing... this may change your perspective. 5.0 out of 5 starsA must-read for the young and the confused! The Divine Reality is a must-read for every young person confused about religion and God. It explains very compassionately and logically the case for the existence of God, evidences for the truth of the Quran and Prophethood of Muhammad, and most importantly provides clear logical reasons for why humans should worship their Creator. I highly recommend this book for all person involved in Dawah or experiencing doubts about these topics.